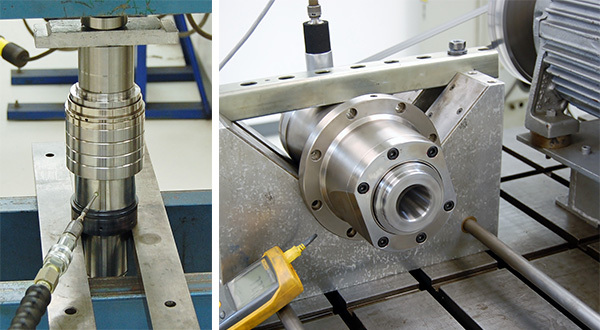 Your Bridgeport spindle is in expert hands with the factory-trained, Big Plus–certified technicians at High Speed Technologies, Inc. We have repaired dozens of Bridgeport spindles to original factory performance. Need it fast? We can repair your spindle within three days of customer approval, and we offer reduced pricing for longer lead times. All spindle repairs are backed by a complete warranty and our 30-year reputation of OEM-quality spindle repair. 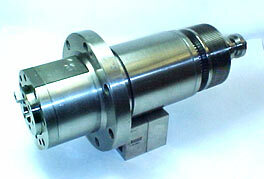 The Bridgeport spindle offer robust design. They use standard size bearings and a basic repair can be accomplished in a few days. They have grease bearings that typically require 5–8 hours for proper run-in. 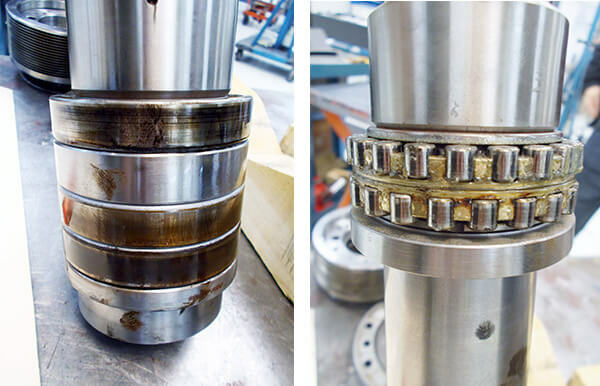 Below are other examples of HST’s OEM-quality repairs on Bridgeport spindles. For expert Bridgeport spindle repair, call us at 1-603-483-0333 for a quote. We are fast, experienced, and our work is guaranteed. 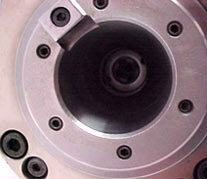 We provide emergency Bridgeport Spindle Repair and rebuild. This Bridgeport spindle was off of a VMC 3020. Our customer, Duke University Physics Department, stated that it was running hot and it had noisy bearings. The machine was also part of some critical production so they needed our emergency repair service or QTA. They shipped the spindle to us well packed and protected. This is important. Often we receive spindles that are poorly packed and suffer more damage in transit that the original problem. This Bridgeport VMC 3020spindle was well packaged. This is important to avoid additional damage during transit. Bridgeport spindles are stout and well made for a reasonably priced CNC machine. Once we began our examination there was no wonder why the spindle was running hot. After ten years of operation the lubrication had dried out and was almost totally nonexistent. The #1 bearing was on the verge of a complete failure. The # 1 bearing dry as a bone. Note fractured cage indicating a catastrophic failure was imminent. On the right is the Bridgeport 3020VCM ready for shipment. When the Bridgeport Spindle Repair and rebuild was complete the spindle ran flawlessly. The vibration reading 0.0248 in/sec and the runout on our 300 mm test bar was 8µm. We repair Bridgeport VMC 800 spindles to OEM quality. 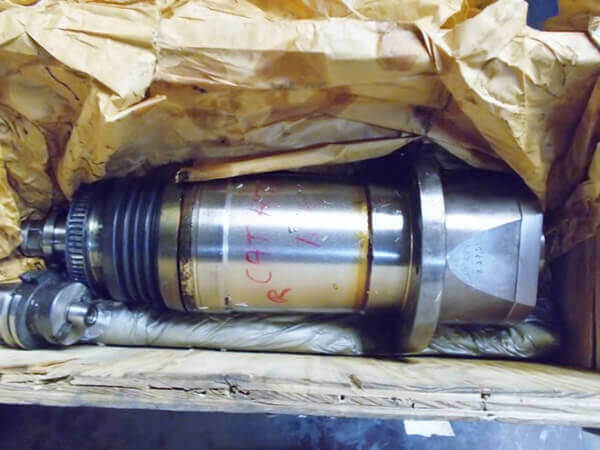 When we received this spindle the shaft was seized. 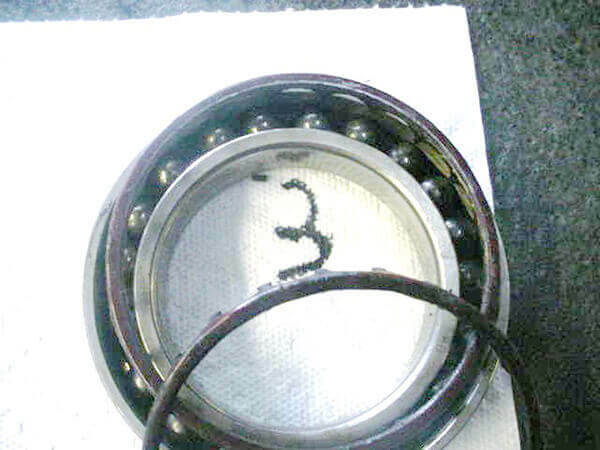 Our forensic examination found that the #2 bearing suffered a catastrophic failure. All of the bearings were heavily contaminated with some unknown liquid (most likely tool coolant) and all were near total failure. Other than that the spindle was in pretty good condition. But even though all of the drawbar springs were intact our standard quote includes total replacement. # 2 bearing completely failed. Liquid contamination on the rear roller bearing. Bridgeport VCM spindles incorporate a rather compact and robust bearing stack that is held on the shaft with a hydraulic nut. To set the bearings with a hydraulic nut requires 10,000 PSI and a hydraulic press. On the right a Bridgeport VMC 800 on our test stand. When we finished rebuilding this Bridgeport VMC 800 the vibration reading was 0.02075 in/sec and the run-out on the taper was 1 µm. This spindle was in our shop about 18 months earlier. At that time the spindle wouldn’t hold a tool. The spindle was in rather rough condition and did not pass our run-out and vibration testing. However, the customer only wanted the drawbar assembly repaired. At HST we understand that some smaller shops have limited budgets and simply cannot do everything they would like to do. No Problem! We are happy to do the work piecemeal to help a customer stay in budget. And look, the customer got another 18 months out of the spindle. But now the bearings were done. Bridgeport Discovery spindles use a similar bearing configuration as the VMC; a tandem pair mounted back to back with a single and a roller in the back of the spindle. Stout and compact. We really like this design. The spindles use readily available ABEC 7 Super Precision Spindle bearings. The design allows for inexpensive and quick rebuilding. If you own a Bridgeport CNC machine HST can restore your spindle to like new condition in just a few days. The Bridgeport Discovery spindle bearings are arranged in a robust and compact design. When we received this spindle the runout on our test bar was 40µm after our rebuild it was 6 µm. Our vibration readings in the front were 0.64890 in/sec when received. The front reading after our repair was 0.01800 in/sec. The customer sent us this Bridgeport 720 spindle because he suspected a lubrication failure. What caused such suspicions? It was “making a howling noise”. Part finish was also unacceptable. Our inspection showed that the customer was correct. The grease lube had definitely deteriorated and the bearings needed replacement. When we finished the Bridgeport Spindle Repair and rebuild instead of howling, the spindle was purring like a kitten making perfect parts. Assembled runout on the taper was 2 µm and the front vibration reading was 0.02267 in/sec. When we received this Bridgeport VMC 760 spindle the shaft no longer turned freely. Our inspection revealed that the # 3 bearing suffered a catastrophic failure. That is the cage had failed and the rolling elements were no longer properly spaced. There were strong indications that the degradation of the lubrication was the root cause. But sometimes it can be difficult to determine exactly what happened first. As lubrication breaks down contamination is generated that exacerbates the process. However, any contamination that gets in causes the lubrication to breakdown and generate more contamination. For these reasons it is very important to start off with the correct high quality, filtered lubrication and an ultra-clean environment. What came first? The grease failure or the contamination. In the long run it doesn’t make a difference. Both will cause premature bearing failure. This # 3 bearing failed due to lubrication degradation. After our comprehensive spindle repair the runout at the taper was 2 µm and the front vibration numbers were 0.02175 in/sec. When I was a young maintenance mechanic in a mold making shop back in Brooklyn, NY an Old Portuguese mold maker showed me how to set the dials on the Bridgeport Master Milling machine. With huge magnifying glasses over his regular glasses he would manually turn cranks to machine any number of precision parts. There was no digital read-out. Every shop you went into had a Bridgeport milling machine. Bridgeport set the standard back then. Things have changed. 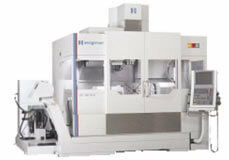 Today Bridgeport provides sophisticated 5 axis CNC machines like their XR500 5 axis milling machine. HST repairs the spindles that go into these machines. Today’s machines make parts faster and to tighter tolerances. Gone is the skilled machinist setting dials and turning hand cranks to mill away a few thousands at a time in straight lines. Now a programmer is setting complex tool paths on multiple axis with automatic tool changes; a whole new skill set. But when the programmer makes a mistake or a part isn’t properly located…crash. That’s when you are glad you know about HST. We repair Bridgeport spindles. Spindles on older Bridgeports only ran when the machinist was operating them. Spindles on today’s machines may not stop for days at a time; even running “lights-out”. This is another good reason to use HST to repair your Bridgeport spindle. We will restore your worn or damaged Bridgeport spindle to factory new condition. We only use top name brand super precision ABEC 7 spindle bearings. Journals are restored to micron tolerances, rotating components are precision balanced, tool interface surfaces are restored to original run-out tolerances; in short you spindle will be as good as new. Bridgeport has been a leader in the machine tool industry since 1938. 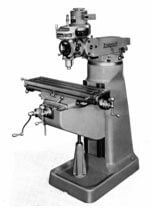 When Bridgeport introduced their Series I Standard, a milling machine with a revolving turret that moved the head from one end of the table to the other, it revolutionized the machining industry. This machine, offered unheard of productivity and versatility at a price that every machine shop could afford. Over the years, Bridgeport has continued to set the standard for milling machines, as well as expanding to provide many more machining solutions. The Bridgeport name is known and respected worldwide. For over 3 decades HST has set the standard for spindle repair. Some things don’t change.